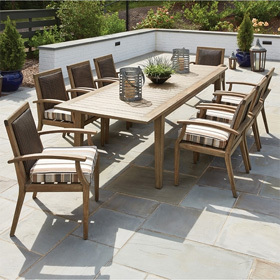 This luxurious outdoor dining arrangement from Telescope Casual comes with your choice of four Leeward MGP Sling Supreme Arm Chairs or Leeward MGP Sling Supreme Swivel Rockers (you may also mix and match these stationary and motion-based chairs to create a more personalized set). Both the arm chairs and swivel rockers have high backs which provide increased lumbar support, as well as water-resistant Marine Grade Polymer (MGP) frames and quick-drying sling coverings. The set is completed by an MGP top table that comfortably seats four individuals. Lifestyle Image: Sling fabric shown in Natural (20D) with Avocado cushions (82A), Blake Umbrella fabric (377) and Snow frame finish. Supreme Arm Chair 29"W x 28.5"D x 44.25"H 34 lbs. Supreme Swivel Rocker 29"W x 28.5"D x 44.25"H 43 lbs. Dining Table 54"Dia. x 29"H 68 lbs.